It was just few days after I launched this website, when Min and I went to visit my parents. And, my parents seemed to be very excited over the idea of KoreanHomeCooking.com, maybe more than I was (my dad is a super foodie and my mom is also a proud chef of the house). I think the foodie gene flows in my family ;D According to mom, dad had been talking for days about different dishes that mom could cook when we come home, so that I could blog about them. When we woke up in the morning, dad already had a list of breakfast menus from which we were to choose one. Soft Tofu Soup was a winner for the day. 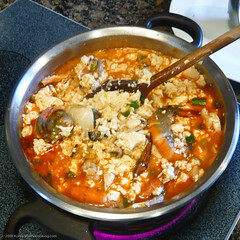 Please note that my mom's recipe below makes very mild, less spicy Soft Tofu Soup than ones found in restaurants. 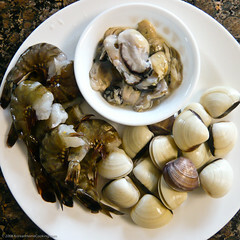 Prepare seafood (oyster, shrimp, clams) aside. 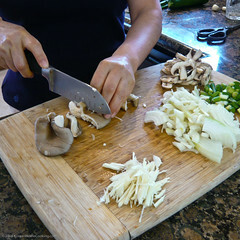 Cut vegetables and set aside. 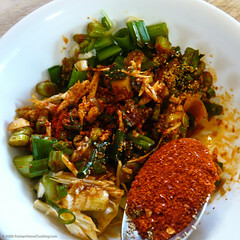 Prepare a mix of seasoning with red pepper oil, chili powder, minced garlic, chopped scallion, and water. 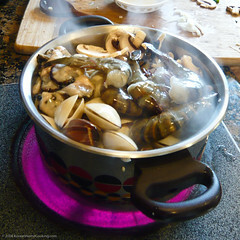 Glaze the pot with sesame oil in high heat. 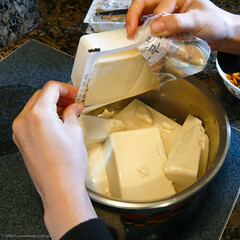 Add soft tofu. Some soft tofus are sold in tube packages. They are good, too. 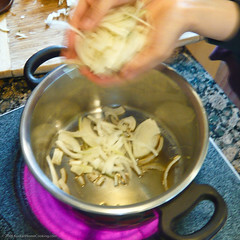 Tip: There is no need to add water here; the soft tofu will spit out water when it's cooked. You will see. 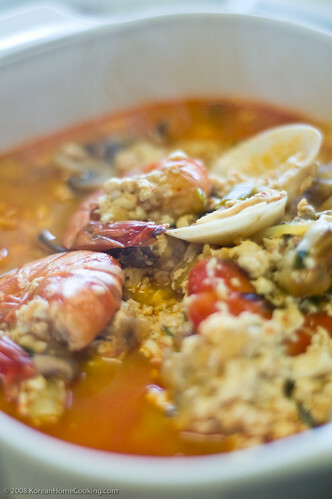 Add rest of the vegetables and seafood. Add the seasoning mix. 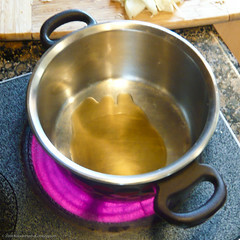 Close the lid and let it cook for 10 minutes at medium heat. Stir occasionally so that tofu is well mixed with other ingredients. The water in the soup came from soft tofu! If you like, add a raw egg to the soup right before serving. What's the purpose of the raw egg? To thicken up the soup? Add more protein? Thanks! Yes, I think they are the reasons. In old days when foods were scarce during the war time or following it, adding a raw egg to soup or even to a cup of coffee/tea to boost nutritional values used to a fashionable thing to do in Korea. Plus, I find tofu and eggs generallly make a good combination of foods together. When I hit up my local Kimbap shop here in Seoul they always drop an egg in right before serving....The pot and soup are hot enough that it cooks right up and really does compliment the soup! This is my FAVORITE soup!! Amanda, I envy you so much for being in Seoul! I can't wait to go back to Korea to try all kinds of street foods there. Glad you had a nice time in New York. Happy anniversary! My husband, an American, spent a few years in Seoul. I visited Seoul once and fell in love with the place straight away. We both love Korean food and Soon Tofu Jji Gye is our favorite dish. I looked on the Internet for quite a while for the right recipe and tried many times without success, until I came across your blog. 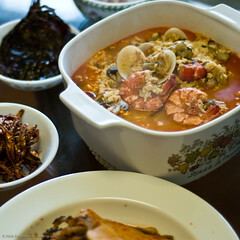 I cooked it for our 3rd wedding anniversary yesterday and my husband said it tasted very authentic, many thanks to you! Please, keep blogging so we can learn more from you! By the way, the photos on your blog are very beautiful. You should write a cook book! Hi, Rose - It is so good to hear that first you are from new york and second you used my (well actually my mom's) soft tofu recipe to celebrate your anniversary. How sweet! :) Thanks for your kind words. Thanks for your sweet response! Actually I'm from China. I moved to New York three years ago. 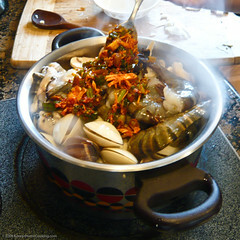 I first fell in love with Korean food about 20 years ago when I lived in Beijing. There were some Korean eateries there back then but they only served cold noodle soup. Now there are many great Korean restaurants in Beijing. My husband and I like eating Korean food regularly, so we go to Flushing, Queens, to shop in Korean supermarkets and eat in Korean restaurants. I don't know if you have visited Flushing. I personally think Korean food there is better than in the Korea Town in Manhattan. Thanks again and look forward to more of your recipes. Please pass on our gratitude and New Year's wishes to your mom.